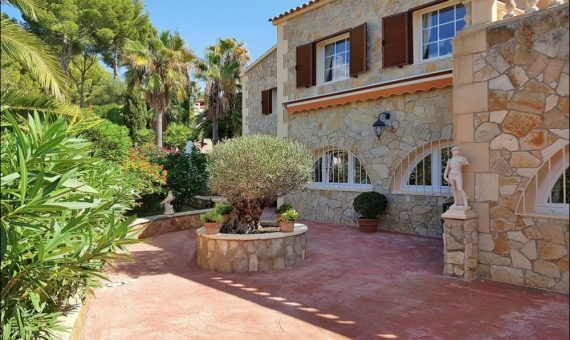 Beautiful villa in an exclusive complex with a communal swimming pool on the first line of the golf course in Nova Santa Ponsa, Mallorca. 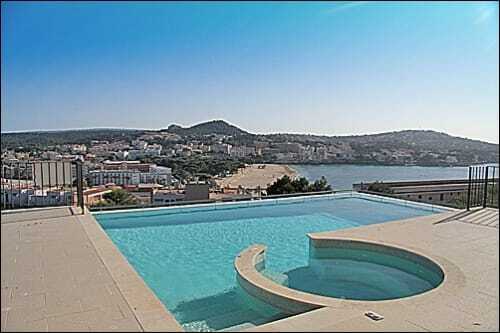 Land area is 440 sqm with a beautiful and well-kept garden with a private swimming pool. Living area of 220 sqm divided into a living and dining room with fireplace and access to a charming terrace of 80 sqm, overlooking the garden and pool, separate kitchen, 3 large bedrooms, each with bathrooms en-suite, guest toilet and utility room. The villa is equipped with air conditioning (heat / cold), ADSL line, offers 2 personal parking places and will be sold unfurnished. Well located close to the prestigious marina of Port Adriano, the marina of Santa Ponsa, sandy beaches, entertainment centers, and well-developed infrastructure.